Signing up to a new shoot can be a bit of a gamble. Not knowing how the pheasants will be presented on each drive or if the shoot lodge meets your expectations can be a little disconcerting. Tales of guns travelling the length of the country and parting with thousands of pounds only to go home feeling totally underwhelmed are thankfully rare, but it is still worth doing your homework before confirming your booking. One Hampshire-based gun revealed that he learnt the hard way last season. “My expectations for the day were completely at odds with what was being offered,” he said. So how should you set about researching your chosen shoot? Nowadays, there are a plethora of ways to learn more about the estate and its management – from nifty social media platforms like Facebook and Twitter to on-the-wall video podcasts – and all will help you to book sport with much more confidence. Throughout the year Shooting Gazette publishes detailed shoot reports after visiting different shooting estates throughout the season. They can give guns a valuable insight into the workings of a shoot, detailing the format of the day, the drives, the topography of the estate and how the shoot lunch fared. It is well worth sifting through your back issues to see if your chosen shoot has been featured in the past. Many of the shoot reports are also featured online as well, so log onto the website. The regional representatives for BASC, the Countryside Alliance, and National Organisation of Beaters and Pickers-Up should be able to offer an honest account of your chosen estate. If you live close enough to the shoot in question, spending a Saturday touring the ground is a good way of getting a feel for the place, and could save sleepless nights in the lead up to the season. Meeting the gamekeeper, walking the drives and inspecting the shoot lodge will allay any fears you may have before signing a cheque. GunsOnPegs has also launched an innovative new video podcast facility, which gives guns an unique insight into how a shoot is run as if you were there on a day.A selection of podcasts have already been released on GunsOnPegs TV, with many more to come. James adds that travelling to a new shoot is one of the best things about the sport. The quality of the birds is not the only thing you should look for when seeking a new shoot. Does the shoot have a presence on Facebook or Twitter? 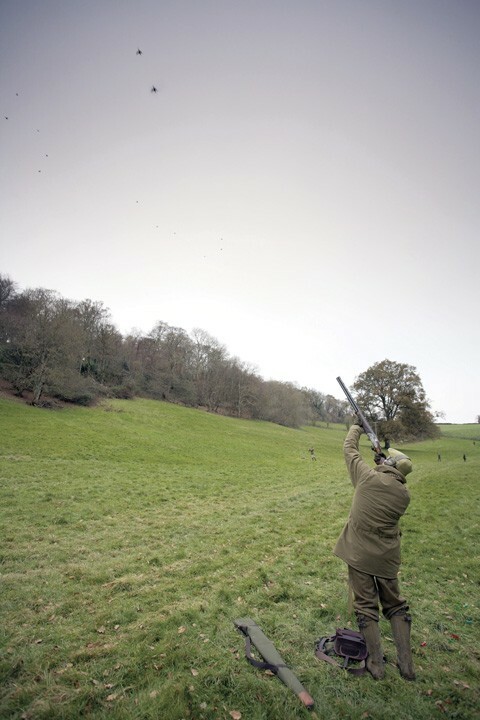 Shoot owner Jono Garton regularly uses Facebook to promote Bodfuan shoot. “I bought the shoot in Gwynedd a year ago and quickly created a Facebook group,” he reveals. Bodfuan’s group now has nearly 700 members and he regularly posts updates of the shoot’s activities. Ensuring all the paperwork, from a contract to insurance, is in order will also make for stress-free sport. Is he new to the job or does he have a lifetime’s experience flying birds off Exmoor hills? Has he always worked on a wild bird shoot or is this a brand new venture? No gun wants to feel like a guinea pig. Having absolute faith the gamekeeper can deliver you and your shooting comrades a cracking day’s sport will mean you will glean even more from the day. Don’t be afraid to quiz fellow shooters about a shoot in one of the many dedicated online forums. Barnaby Dracup is the editor of ShootingUK, which is an affiliate of the Shooting Gazette website. Using a sporting agent to book your day can take any uncertainty out of the equation. Roxburghshire-based Sporting agent Charles Brownlow advises checking off your own particular criteria before booking. “Number one on my list is to confirm the number of birds booked. I hate the thought of guns shooting their bag before lunch, I have never had it happen but it is a crucial factor for a happy day. If a shoot sells a day with X number of birds it must last a full day,” he says, adding that it is also imperative to check the quarry on offer. Lastly, ask what the preferred cartridge is – bismuth, lead, fibre or plastic. Make sure you know what the estate allows.